“The Mad Voyage of Prince Malock” is now available! You read that headline right. My fantasy novel, The Mad Voyage of Prince Malock, is now for sale on Amazon, Kobo, and Smashwords* for $7.99! Prince Tojas Malock, Crown Prince of the island of Carnag, is chosen by the sea godess Kano to go on a dangerous and potentially lethal voyage to the island at the edge of the world, World’s End. Confident in his own skills, Malock assembles the finest crew money can buy and sets out into the mysterious southern seas beyond the edge of the Northern Isles. But when he loses almost the entire fleet in a month, leaving a single ship struggling to remain afloat and a ragtag crew that wants to be anywhere but, Malock realizes that he is in way over his head. It doesn’t help that the information about the southern seas provided to him by his lover – an aquarian woman named Vashnas, the only mortal to ever reach World’s End and return alive – turns out to be less-than-accurate, causing him to wonder what else she might be hiding from him, and why. Kinker Dolan, an old fisherman from the small and obscure island of Destan, has a secret. It’s a terrible secret, a secret that fills him with guilt and shame in equal measure. 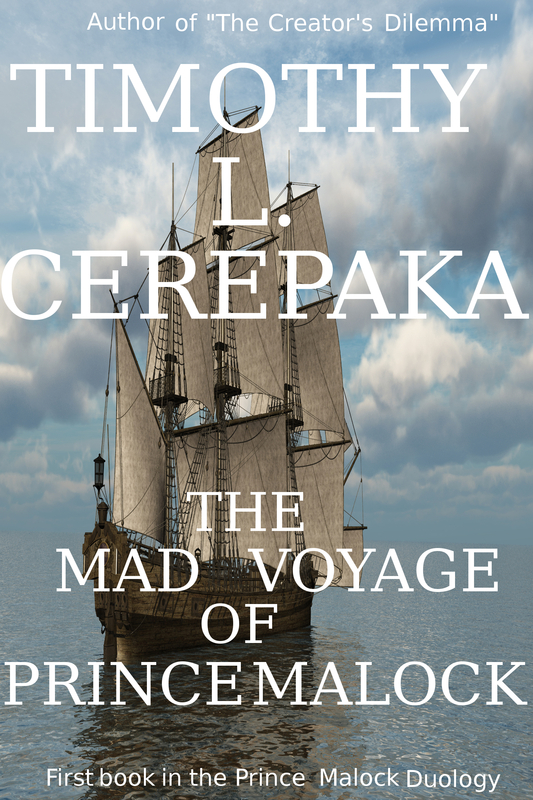 Yet when he attempts to flee Destan to escape his guilt, he ends up getting drawn into Prince Malock’s mad voyage, where he must use all of his wits and knowledge to keep his life – and his secret – safe. With mortal-eating gods, murderous aquarian pirates, and betrayals within the crew itself, will Prince Malock, Kinker, and the rest of the crew of the Iron Wind make it to World’s End alive? And even if they do, how will they react to the true purpose of the voyage? And if you want to be immediately notified of when the sequel, The Return of Prince Malock, is released, then subscribe to my email newsletter here. *Will be available in Barnes & Noble, Google Play, and other ebookstores very soon. Short stories generally do not require as much worldbuilding as novels. That may seem an obvious thing to say, but it’s something I sometimes struggle with when I’m writing fantasy or science-fiction short stories. Unless I set a short story in a universe I have written in before, it means coming up with a new world to write in. I try not to do a whole lot. Whereas with a novel I might map out the history of the world (to varying depths depending on the needs of the story, of course), with a short story I will stick strictly to what I need and never make notes on it, again unless it happens to be set in a world I’ve already written in before. Still, despite that, writing short stories can be difficult for me because I run into a couple of temptations. The first is to expand the short story into a full-length novel. This isn’t an entirely bad thing to happen, mind you, but I don’t always want to write a novel because I’m not always interested in fleshing out a world or universe in immense detail. Sometimes I just want to explore a simple idea, without having to commit to the length of time a novel usually requires. The other temptation is to not use any of my good ideas. This thought stems from my fear that I might “waste” a really good idea that I could use for a novel later on, but it’s a really silly fear when you think about it. I don’t believe there is such a thing as a “wasted” idea. After all, there’s nothing stopping me from taking that same idea later on and expanding upon it in greater detail in a novel. Nonetheless, every time I sit down to write a speculative fiction short story set in a universe I’ve never written before, I feel like I have to do the same amount of worldbuilding I would do for a novel. This is where I am thankful for the Ambage, my writers’ group. For both of the anthologies that I’ve contributed to so far — Constellations and Fantastic Depths — I’ve forced myself just to write my stories and do only as much worldbuilding as each story requires, no more, no less. Once I get past this irrational desire to worldbuild in excess, however, short stories are usually great fun for me to write. Not quite as fun as novels, true, but they are still fun, as writing should be. In an earlier post of mine, I wrote about the importance of keeping worldbuilding in perspective for speculative fiction writers. I wrote it because too often, I see speculative fiction writers (fantasy writers in particular) worrying far too often about some obscure detail about their world that may or may not be important to the story and not enough about the story itself. I was hoping to reach out to other speculative writers with similar opinions or at least let other people know what I thought. One thing I forgot to talk about, however, is how you should worldbuild. Personally, I am against the idea of sitting down and planning out the entire world before you write the first word of the actual story. I find that method is a good way to kill your love for the story, mostly because it uses up all the creative energy that should have gone to the story itself. Instead, I advocate worldbuilding through writing. That is, coming up with details about your fictional world or universe as they are needed in the story itself. That’s how I’ve been approaching my upcoming novel, The Mad Voyage of Prince Malock. I started out with only the barest knowledge of the world I was writing in, enough to get the story going but not enough to crush my imagination and creativity. Beyond those few basic details, the rest of the setting was a complete mystery to me. And boy, was writing the first and second drafts fun. Both drafts came spilling out of my fingers like the ocean tide. New worldbuilding ideas constantly came to me, both while I was writing the drafts and while I was doing other things unrelated to the novel. In fact, I’ve come up with so many ideas that I doubt I’ll be able to showcase all of them in the novel itself (which is good, actually, because not all of the ideas are important to the story and not all ideas are equally interesting). I imagine that I’ll get even more ideas when I start work on the third draft later. Now I didn’t worldbuild entirely through writing, mind you. I took some time out of my day to do a little bit of worldbuilding outside of my writing time, but even then, I was working mostly from what I’d already written in the story itself. Also, I didn’t let these details bind me down. If I came up with a better idea while writing the story that contradicted something I wrote in my worldbuilding notes, then the idea in the story became canon and the one in my notes was deleted. Another important point I’d like to emphasize when using this method is taking notes. You will undoubtedly come up with a lot of worldbuilding ideas when writing, some major, some minor. To keep your ideas straight, I suggest writing down these little details in your worldbuilding notes, either during or after your writing time, and referring back to them when necessary. It will cut down on revision later and make you world seem far more consistent. If you remember to do that, you might have a lot of fun using this method. So far, it’s been a lot of fun for me, much more fun than sitting down and figuring out every last detail before I write the actual story. As usual, I must add that this method probably doesn’t work for everyone and that if you’ve already tried it and found you don’t enjoy it that you shouldn’t do it. There are no right or wrong ways of writing a story. Only what works for you. Nonetheless, I suggest trying it out at least once. You might just enjoy it. How do you worldbuild? Post your thoughts in the comments! As of this morning, I finished writing the second draft of my upcoming fantasy novel, The Mad Voyage of Prince Malock. At 125,437 words, it’s longer than the first draft, but also a lot better because I understand the characters, plot, and world better than I did in the first draft. Per my usual method, I am putting it aside while I work on something else. Then I’ll write the third draft and move onto the revision process and, after that, publish it. Like with the first draft, this draft just flowed out of my fingers onto the computer screen like a fountain. That it’s coming so easily just blows my mind and makes me think I’m onto something (although of course this “something” will require a little revision before it’s ready to show to anyone). In context, King was talking about describing setting, but I think it is a useful reminder for we worldbuilding speculative fiction writers, who can sometimes get so caught up in creating our fictional worlds that we never get around to writing the story that inspired the world. In particular, the last line — “It’s always about the story” — reflects one of my own deep beliefs about writing, which is that the writer should always focus on what will help the story first and foremost and worry about anything else second. Here’s an interesting blog post about worldbuilding and what some fantasy authors think of it. I find the quote at the end from Jeff VanderMeer to be particularly good, myself. In this week’s Sunday Meme Thread, Sudden Clarity Clarence has an epiphany that would make for an interesting premise of a speculative fiction novel or short story.